1984, University La Verne, attended courses. 1989-1991, Geneva Airport TWA Airlines. 1993 joined a family owned company, Oceanbulk Maritime S.A. to the position of Assistant Crew Manager and as of 1995 Crew Manager till 2011. June 2011 - today, Starbulk S.A. position of Crew Manager. Angie Hartmann has been an active member of WISTA (Hellas) since 1999. She is also the President of WISTA (Hellas) since April 2014. 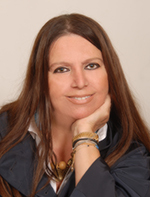 Angie Hartmann is very active in the shipping sector and has participated in numerous conferences and seminars both an attendant as well as a speaker.